I was looking at getting this comic for quite some time mainly because it was a very affordable Silver Age key issue at a very high grade and I wanted a high grade Silver Age comic in my collection. I finally pulled the trigger on it when I heard a rumor that Ego might be one of the characters in Guardians of the Galaxy Vol. 2. I've had my eye on this Thor comic for a couple of years now, but always put off buying it to get others comics that were higher up on my want list. Comics that might be out of my price range if I didn't buy them soon. 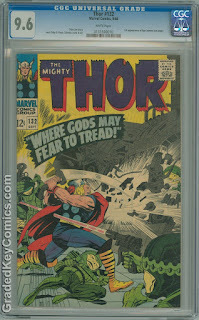 The price of good ol' Thor #132 wasn't going anywhere. That was until, one day, I was scrolling through my Facebook feed, and saw that Cosmicbooknews.com that Ego might be showing up on the big screen. 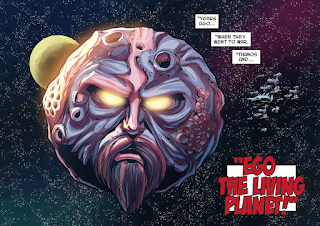 There was also the rumor that Al Pacino was going to be the voice of The Living Planet. I figured that if I didn't snag this comic now, that it would soon shoot through the roof in terms of price. Especially in the current market. Any hint of a character making an appearance in a movie or T.V. show sends demand through the roof. Another reason I got Thor #132 is because of the growth potential of it. I managed to get this copy for $280 which is a little higher than they were selling for but I still feel like I got a good deal on it. In my opinion, this is a very undervalued key issue. Even if the rumors turn out to be false, I think that a 9.6 NM+ copy will slowly be on the rise.